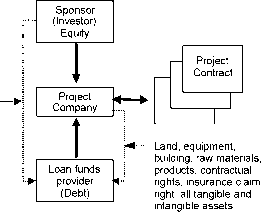 In the case where a sponsor (investor) who plans and aims to achieve a project directly or indirectly assumes guarantee for repayment of loan debts for the project, this will be considered as a credit to the investor company (this is called corporate finance), not to the project, because profitability of the overall investor company including said project becomes a resource for debt repayment. Meanwhile, project finance has a basic structure where a project, not a specific entity, is subject to credit, i.e., multiple entities rather than a sole entity, are involved with a project by bringing in various elements, providing security, and granting credits. Non-guarantee for debts by a sole entity means that a project is supported by a group of elements and such a system for an overall project generates credit. From the standpoint of a provider of project funds, reasonable expectation for repayment of debts is based on the stability of cash flow generated from the project. Security for repayment is cash flow, or the project's assets or project structures that generate cash flow. To this end, a package comprising various elements, such as performance guarantee, direct guarantee, and indirect guarantee by various entities concerned with a project,constitute part of security, and a combination of such security elements and a system to support them will be created. Through creation of such a system, a project that has not been achieved can be an entity with credit. Project finance also refers to a system that allows funds to be injected into a project efficiently and effectively. This system supports a project and enables fund procurement. Formation and realization of finances are processed in line with formation of a project structure, and they are integrated in the process where the project is realized. Invested shares as secuirty etc. Cash flow of the project, all tangible and intangible assets, contractual right, equity of the sponsor for the project company's stock, etc.